Gameboards, borehole schematics, and array data user programs are part of basic PowerLog and will be provided to all clients current on maintenance. Anisotropic stress will be provided to all users with FracRAT. 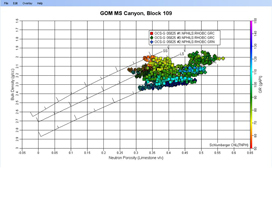 For information on PowerLog’s petrophysics, rock physics, facies analysis and statistical mineralogy capabilities. Work the way you want with PowerLog petrophysical software. You drive the order of actions and the amount of guidance provided. Generate models fast. Know where to frac. Work on thousands of wells with data located anywhere in the world, as an individual or as part of a team. PowerLog is truly multi-well and multi-user, providing a powerful well log interpretation environment. Faster and easier than ever, PowerLog does the heavy lifting so you get more work done. PowerLog is used every day by petrophysicists, geologists, reservoir engineers and others involved in oil field appraisal and development. Efficient multi-user functionality lets your petrophysicist analyze logs, your geologist pick tops and your engineer create zones. PowerLog helps you locate pay zones in each well and understand how the reservoir connects across the field. Greater insight into porosity, water saturation, capillary pressure, and other key indicators help reveal a field’s potential. Extremely portable, PowerLog can be used anywhere and powerful visuals get the point across for quick collaboration on important drilling decisions. Colleagues around the globe can share and interpret data for streamlined work effort and peer reviews. Petrophysical analysis by its very nature is a highly visual process. When you see a problem in a logplot or histogram, it makes sense that you would want to make a correction right there. PowerLog makes it easy for you to do just that. All changes are immediately reflected everywhere the affected data appears. When viewing a logplot, for example, you may see a need to make a depth shift. All you need to do is select editing mode and make your adjustment. This is very fast and completely logical. Normalization is another change that is easily made through either the crossplot or histogram. For example, if the calibration was off in one well, you can fix it with a bulk shift or gain and offset. PowerLog petrophysics software supports dual interval display during multi-well editing—you simply identify a soft interval and a hard interval and use them to calibrate the entire log. PowerLog can even auto-normalize if you have a series of wells that require the same fix. As a final example, the Synthetic Curve Generator allows you to predict curves in wells where data is missing and to automate bad-data editing. For a curve that has problems, select a good section and PowerLog uses linear regression analysis to fix the problem. PowerLog outputs the equations, which you can cut and paste into a MathPack if you want. The Synthetic Curve Generator can also be used for facies classification. Calculate clay volume, porosity, lithology and water saturation with a variety of simple and complex lithology and shaly sand modules. Make environmental corrections on logs from all of the major logging companies including Schlumberger, Halliburton, Baker Atlas, and Sperry-Sun. PowerLog has everything you need to perform petrophysical analysis and view the results. All standard data formats are supported and easily loaded, including array data. You can load hundreds or even thousands of logs at a time. Once data is loaded it can be inspected in a variety of viewers, including logplots, crossplots, basemaps, and histograms. The Basemap viewer allows you to see your wells relative to one another with an overlay of cartography, contours and attributes. To assist in correcting and analyzing the data, PowerLog provides processors and leading algorithms such as Archie, Dual Water, Waxman Smits, and Juhasz. Every action in PowerLog is tuned to run fast and work the way you do. Data is the heart of petrophysical analysis—and PowerLog. All data are available for your inspection, in both graphical and tabular form. Any item managed by PowerLog—from a well to a top, curve or other—can be selected, viewed and edited. Any collection of items can be grouped together, and these groups are also managed as items that can be selected, viewed and edited. Every change you make in PowerLog, whether through a process, viewer or table, automatically updates everywhere the data appears. A change made in the crossplot viewer, for example, will cause an update to the histogram view. Likewise, a change in one process will update others that share the data. PowerLog honors the original imported data and automatically links key non-log data to processes based on user selection. Log data is commonly available in a mixture of increments between 6 inches and as little as 1/10 inch. PowerLog honors these measures and handles interpolation and extrapolation during processing and output so you don’t have to do so. Both units and measures are preserved, making the analysis as true to the data as possible. For example, when data such as Rm appears in the log header, it can be captured and fed directly to the associated process so that when a correction is needed the parameter is already set. Every project is different. Petrophysicists need the flexibility to approach each one in the most effective manner for that project. PowerLog works the way you do. No structured workflow manager is required. The menu bar and user interface guide you through the processing steps to complete your analysis. These natural processing steps follow common practice, but allow deviation at any point. PowerLog proposes structure, it does not impose it. At every step of your analysis, PowerLog provides processes and algorithms that you can use to correct, process and display data. Among the processors are basic, Vshale calculator, simple and complex shaly sand analyses, and multimin lithology. Correction editors include depth shift, baseline shift, trend and square, patch, splice and environmental corrections. Because critical decisions depend on your analysis, a clear and detailed history of your actions is imperative. PowerLog keeps a record of every action taken that affects the data. You do not need to undertake a massive documentation effort to ensure that months or years later the project methodology is still understood. You can also undo or redo actions, and recover items from the trash. These safeguards turn potential disasters into easily reversed mistakes. You can feel free to experiment knowing that you can change your mind if you don’t like the result. PowerLog provides the means to go beyond its standard capabilities through user programming and optional integrated products. APIs are available for VB.Net. With these APIs, you can create custom interpretation routines, call specialty algorithms, and integrate with other software, for example. PowerLog works across a network and can link to data anywhere. You can use one computer to access PowerLog on another and work with data on yet another. PowerLog is also completely portable. All you need is a laptop to carry PowerLog to the well site, out to the rig or onto an airplane. When you reopen the application it will open where you left off, with all the viewers and data just as you left them. PowerLog works the way you do. Collage is an online ‘pasteboard’ for including logplots, histograms, crossplots, and images from one or more wells on a single presentation. You can connect logplot tops from adjacent wells and/or shade between selected tops. Also provided is a direct export to Microsoft PowerPoint. Collage allows users to embellish final well log output by incorporating depth-registered rasters (scanned paper log image files), cores photos, FMI-tool images, map rasters and other images, along with a full set of CAD-like tools for the final montage presentation. The end result is a comprehensive presentation of a single- or multi-well cross-section that is only limited by the user’s imagination. Best of all, the montage is ‘live’, so it automatically updates when changes are made using PowerLog®. Display and edit digital log data and bore hole images through a user-friendly interface. As changes are made, they are immediately reflected in the logplot viewer and all other viewers and processors. Changes made elsewhere are also automatically updated in the logplot viewer. You can define defaults for curves, tracks, and grids, and can use the full Windows color palette. Crossplots and Multi-well Crossplots allow the PowerLog® user to display and edit log data through a user-friendly interface. As changes are made, they are immediately reflected in the crossplot and all other viewers and processors. Changes made elsewhere are also automatically updated in the crossplot. Crossplots can display related histograms in the same graphical space. With the overlay tool you can define templates that then overlay the crossplot. Use this tool to draw lines, post equations, create text boxes and otherwise annotate the template. For example, you can define a template of minerals and then overlay your log data to compare the data to known mineral values. Basemap displays one or more wells in spatial context. Wells are displayed automatically when the Basemap is opened. You can change this by selecting wells you want to display from the Basemap or from the tabular view of wells. You can also select wells in the Basemap and view their details in the tabular view, and group wells together for further inspection or processing. Basemap shows wells in context of cartography, contours, attribute maps and bubble maps. Using Basemap, you can see the contours of tops within a field, see the spatial distribution of their wells, and the tracks of deviated wells. You can display pipelines and measure the distance from a well to the pipeline. Borehole image logs, whether electrical or acoustic, can tell you a lot about your formation bedding planes, fractures, and borehole breakouts. Now using PowerLog® you can easily and interactively pick, save, recall, edit, and share dips from your borehole image logs. This new PowerLog functionality nicely complements the Laminated Sand-Shale Analysis application (adopted from the Baker-Hughes product by the same name) with anisotropic resistivity modeling. Together these two new additions to PowerLog help you to further maximize the use of your log data and quality of the analysis you produce with them. Display and edit digital log data using the full Windows color palette through a user-friendly interface. Changes are immediately reflected in the histogram viewer and all other viewers and processors. Changes made elsewhere are also automatically updated in the histogram. Single well histograms allow user specified curve, scales, number and color of bars. Statistics such as mean and standard deviation are generated automatically. Flexible annotation capabilities are included. Multi-well histograms can display individual and composite histograms on the same plot. For normalizing, the reference histogram (individual or composite) is shown in solid color, while other individuals are shown in outline. One or two point normalization is available with an auto rescaling option using specified cumulative frequencies. One or two interval plot is also available. The equations for laminated isotropic sand—anisotropic shale depositions are well known. PowerLog® now offers a graphical way to view these equations and overlay the well data on the graphs for analysis. The process is highly interactive. Adjusting either the Red dot or Blue dot causes the overlay to move around and blue Sw numbers to change on the Vsh vs. PHIT plot. The Laminated Sand-Shale Analysis application is adopted from Baker-Hughes’ LSSA program. Used with 3DEX™ multi-component induction logs, LSSA produces saturations and porosities in electrically isotropic and anisotropic sand-shale intervals. The Thomas-Steiber sand-shale model is central to LSSA’s partitioning of the formation into sand and shale bed fractions. Once these inputs are used to correct resistivity for anisotropy then saturation of the sand beds is computed. You can now easily see your thin, laminated bed pay more clearly with PowerLog’s LSSA capability. Formation tops, text annotation, geologic shading and coding, well header information, and curve headers and footers are available for display. Logplots can be printed to any device with a Windows driver. Solve interpretation problems in reservoirs of complex lithology containing variable amounts of clay. It uses CORIBAND type logic to solve porosity, Sw, Sxo, and mineralogy in an iterative residual hydrocarbon corrections solution. Mineral types and parameters for the 3- and 4-mineral models are user-specified. You can compute water saturation from straight Archie, Indonesian, Simandoux or modified Simandoux. Sxo, Srh are available from Rxo, EPT, or empirical relationship to Sw.
Sonic limit logic is available for bad hole zones. Logic for coal, salt and oil base mud is included. Clay volume from a single indicator or external curve input. Effective porosity from density, neutron-density, neutron-sonic (which all include iterative hydrocarbon corrections), neutron or sonic. Water saturation from straight Archie, Indonesian, Simandoux, or modified Simandoux. Payflags from porosity, clay volume, and water saturation cutoffs. PowerLog® Quicklook contains logic for coal, salt and oil base mud. Generate a summation report of integrated pay, porosity-feet and other details by zone with user-specified cutoff criteria for pay and reservoir rock. In addition, some flag curves and running total curves (such as porosity-feet) can be generated. The depth curve defaults to measured depth, but you can input TVD or TST to account for well deviation and/or dipping beds. A table of reservoir parameters by zone is also generated. Generate a matrix of cutoff combinations using user-specified increments of cutoffs. This sensitivity report of reservoir parameters is useful for studying the effects of various cutoff values on reservoir potential. Derive statistical information about selected curves over a specified zone in a well. Up to 20 discriminators can be used to filter the data, and it can be run over the entire well or a specific zone. The “Batch” version can be used to derive the curve information and/or well information for one or more wells. The PowerLog Synthetic Curve Generator derives an algorithm for computing a curve from a group of other curves. The algorithm can then be used to generate a new curve or to edit an existing curve in the same well or in a different well. It can be run either on a single well or multiple wells. Calibrate logs to core data, and generate data in non-cored intervals. Generate sonic logs where none were run so that synthetic seismograms can be created. Edit sonic log cycle skips. Edit bad density log data in rugose holes. Generate curves to replace bad or missing data. Well log data quality control. Generate and execute custom well log interpretation routines. There are separate modules for writing user programs and for running the programs. Add custom interpretation models using VB.Net. Once “compiled”, the program behaves like other PowerLog programs, with saved screens, notify, Batch Processing and other functions. User programs can access blocks of data, making it easy to do complicated calculations and adjustments. These programs can also access array data from the PowerLog database. Any changes made by a user program are communicated through the notify function, ensuring that all viewers and processors have and display the latest data.